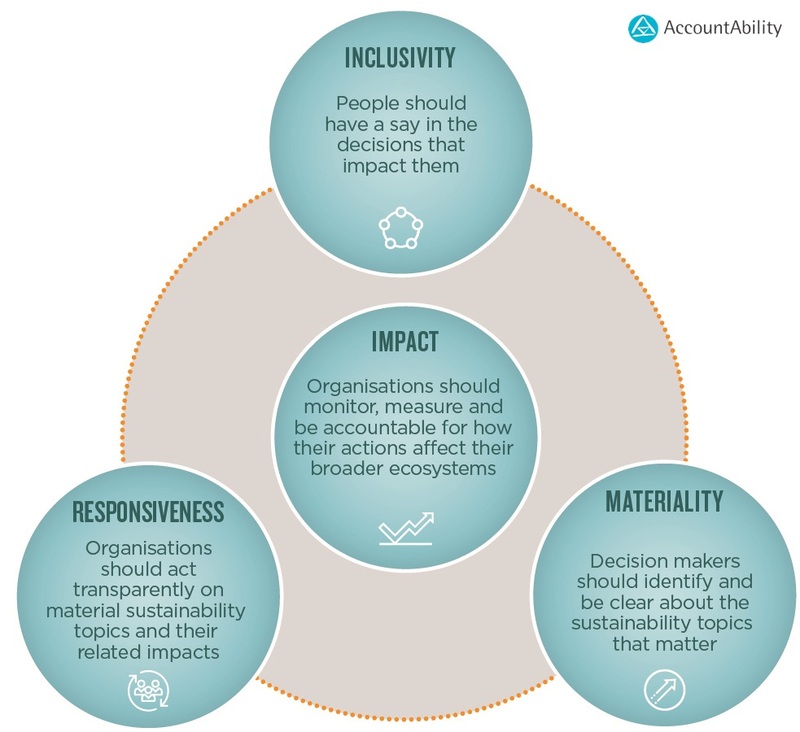 For over two decades, organisations large and small, and across sectors, have successfully engaged AccountAbility’s guidance to identify, prioritise and respond to sustainability challenges to improve their overall, long-term performance. Today’s newest edition of the Principles carries forward tried and true features from this period whilst also aligning with a changed – and charged – sustainability terrain. “By adding a fourth overarching principle - Impact - to the existing principles of Inclusivity, Materiality, and Responsiveness and by setting forth clear guidance for implementing these principles, the AA1000AP, 2018 provides a comprehensive and practical framework for organisations seeking to improve all aspects of their sustainability management and performance.” states Mr. Robert Herz, AccountAbility Advisory Board member and former Chairman of the Financial Accounting Standard Board. As practical a tool as ever, the AA1000AP (2018) remains, importantly, compatible with other leading sustainability standards, certification schemes and reporting frameworks. Over the past 10 years, the sustainability space has become more active and consequential. Global voluntary initiatives, government regulations, investor priorities and stakeholder expectations have created greater external incentives for organisational engagement. Internally, organisations are catching up with or already benefiting from the cost efficiencies and reputational benefits that correlate with sustainable practices. Informed by extensive engagement with stakeholders, the AA1000AP (2018) helps guide participants in a more demanding and still-developing sustainability universe – whether they are seasoned practitioners or new adopters. “I am highly pleased with the release of the AA1000AP (2018) and I truly believe that it will equip organisations of all kinds to respond to the new future of sustainability practice. It is especially noteworthy that the new Principles reflect the increased need for metrics to measure the impact of value creation on long-term performance, and that they can be applied flexibly in conjunction with the leading standards and reporting frameworks in the sustainability management sphere.” said Mr. Dongsoo Kim, Director of the Sustainability Management Center at the Korea Productivity Center (KPC), Korea, and Chair, AA1000 Steering Committee. Among the most notable changes, the AA1000AP (2018) is now positioned as a guiding framework of principles for sustainability management rather than as a prescriptive standard, as it was in 2008. This change is designed to allow organisations even greater flexibility and agility in advancing sustainability management to improve overall performance. In keeping with the growing market demand for value-creation metrics, the AA1000AP (2018) also introduces Impact as a fourth, overarching Principle, in support of results-based management and accountability. “With the market-driven enhancements incorporated in to this latest release of the time-tested AccountAbility AA1000 Principles, we believe we now have a comprehensive and contemporary corporate sustainability instrument to enable a larger number of organisations worldwide to improve their performance. We thank all collaborators for their contributions to this important framework and believe organisations of all sizes, across industries and sectors will continue to benefit from applying the principles to their business strategies and activities.” commented Dr. Assheton Stewart Carter, Chair, AccountAbility Standards Board. The latest iteration features updates to the foundational AccountAbility Principles, key definitions and discussions to reflect current dynamics and lessons learned, as well as enhanced technical specificity within the adherence criteria in response to stakeholder needs. In keeping with leading practices in simplified communications, the AA1000AP (2018) also makes increased use of graphical illustration to convey important concepts, including the interrelated nature of the four Principles, their flexible engagement, and their alignment with companion AccountAbility Standards. “We hope that organisations, worldwide, can apply this simple, practical and multi-purpose framework to advance responsible practices and improve their long-term sustainability performance.” said Mr. Sunny Misser, Chief Executive Officer of AccountAbility. Guided by a core AccountAbility team, the AA1000AP (2018) was developed using a broad-based, global and multi-stakeholder process, overseen by a dedicated Working Group formed in 2016 and chaired by Mr. Murray Sayce, Principal (Corporate Sustainability), ERM CVS, UK. The AA1000AP (2018) replaces the AccountAbility Principles Standard (AA1000APS, 2008). For reports published after 1st January 2019, organisations seeking assurance through the AA1000 Assurance Standard (AA1000AS) should use the AA1000AP (2018). For reports published before this date, however, organisations can continue to use the AA1000APS (2008), allowing time for a transition period. Upon the release of the AA1000AP (2018), the AA1000 Assurance Standard (AA1000AS) Working Group will commence work on the next version of the AA1000AS, planned for release in 2019.